Aim: This study was designed to test the Sudanese parents' knowledge, attitudes and practice (KAP) toward self medicating their children. Design and Methods: A cross-sectional study was carried out by using a pretested questionnaire. Non probability convenient sampling method was used to select the participants. The total sample size was 1000 parents from different health settings in Khartoum State, Sudan in the period from January to June 2011. Results: The obtained response rate was 94.9%. The majority of Sudanese parents in this study 84% used to recommend western medicines to their children. More than one-third of children had received parental self medication in the month preceding this study. The results revealed that parents in 95.7% cases, self medicated their children from minor illnesses. The most frequently used medicines are antibiotics 36.6% followed by paracetamol 31.5%, even though the most common symptom reported was fever 39.7%. In case of self-treatment failure; 64.0% of responded parents used to consult physicians in public settings, while 8.0% seek advice from the community pharmacists. The main reasons of parental self medication were the expensive consultation fees and the long waiting time in the clinics. Conclusion: The study revealed that parents' knowledge was inadequate, and their parental self medication practice showed to be inappropriate. The study outcomes urge instant move toward educating parents on risk of liberal use of medicines in children. 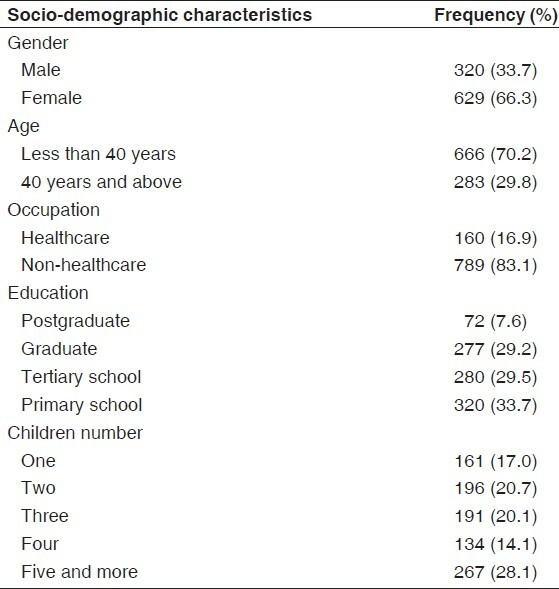 The aim of this study was to test the Sudanese parents' knowledge, attitudes and practice (KAP) towards self medicating their children, to identify the most commonly used drugs and the reasons of parental self medications in Khartoum State, Sudan. A cross-sectional study was designed and the data collection was carried out in several governmental and private hospitals in Khartoum State, Sudan. The study was approved by National Ribat University Ethical Committee. Non probability convenient random sampling method was used to select the respondents. The target population was included parents from different areas regardless of their occupation, age, social status and education. The total distributed sample size was 1000 parents in the period from January to June 2011. A questionnaire was designed to elicit the knowledge, attitude and pattern of practice of the parents towards self-medicating their children and to best addressing the study objectives. Data collection was carried out through structured interviews. A pilot study was carried out in a similar area for validity testing of the contents and the results were not included in the original study. Verbal consents were obtained from the parents who were agreed to participate in the survey. Parents were requested to complete the questionnaire on the spot. The questionnaire consisted of three parts: The first part was designed to obtain demographic characteristics such as gender, age, occupation, education and number of children. The second part was investigated the parents' knowledge, and the pattern of self-medication practice. Questions were used to examine the type of medications given to treat the children, most frequent medicines used and the most favorite sources of health information. In the third part five point Likert scale ranging from strongly agree to strongly disagree was used to determine the attitude and the reasons of parental self medication. The collected data was computed by using SPSS (version 16), then analyzed descriptively and Chi-square test was used for categorical variables' associations. The study showed a very good cooperation of parents, with a total of 949 parents (94.9%) responding. Two thirds of those parents were females 629 (66.3%). The majority of population going through the interviews was less than 40 years old 666 (70.2%), and they were dominantly non-healthcare workers 789 (83.1%). Regarding parents' education level; 349 (36.8%) were university graduates. The obtained results revealed that most of the Sudanese families bearing large number of children, the families were having five and more children were dominant 267 (28.1%), as shown in [Table 1]. Although Sudan is a developing country; the majority of Sudanese parents in this study 797 (84%) used to recommend western medicines, while only 152 (16%) of them preferred to self medicate their children by traditional medicines. There were no significant difference between healthcare worker and non-healthcare workers (P = 0.535) whereas the graduated participants showed a significant difference, P value was (P < 0.001). The majority of interviewed parents obtained their medicines from private retail pharmacies 528 (55.6%), while only 273 (28.8%) of them had their medicines from public hospitals and just a few of them got their medications from friends or private clinics. Most of the participants reported that their children did not have any drug related allergy 687 (72.4%). The study showed that more than one-third of the children 365 (38.5%) had received parental self medication in the last month, while 271 (28.6%) of them did the same in the last year. The results revealed that the majority of parents used to self medicate their children from minor illnesses 908 (95.7%), and only 5 (0.05%) of them reported doing the same in case of more serious ailments. [Table 2] shows, the most common diseases that parent self medicated their children from and the most frequent medicines they tend to use. 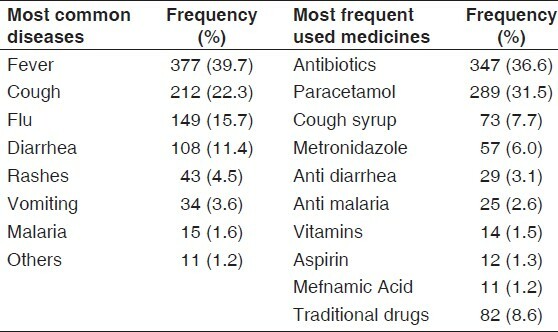 The most frequent medicines used were the antibiotics 347 (36.6%) followed by paracetamol 289 (31.5), although the most common self-treated symptom was fever 377 (39.7%). 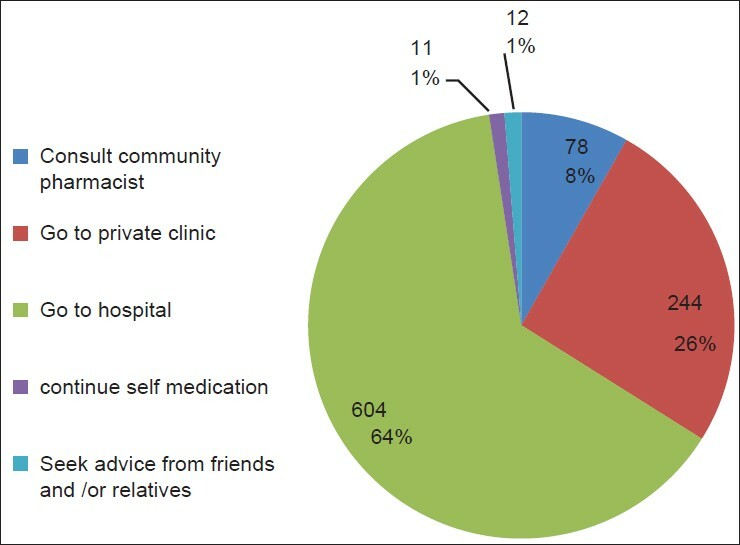 In case of self-treatment failure most of the parents in the present study tend to consult physicians in public settings 604 (64.0%), while 78 (8.0%) of them seek advice from the community pharmacists, as shown in [Figure 1]. The significant difference were found between the healthcare and non-healthcare workers (P < 0.001). The healthcare worker usually went to the pharmacists or to private clinics, while non healthcare usually went to the public hospitals, but sometime went to their relatives, also significant difference found between graduated and non graduated participants (P < 0.001). Some of non graduated participants seek advice from friends, but none of the graduated did. 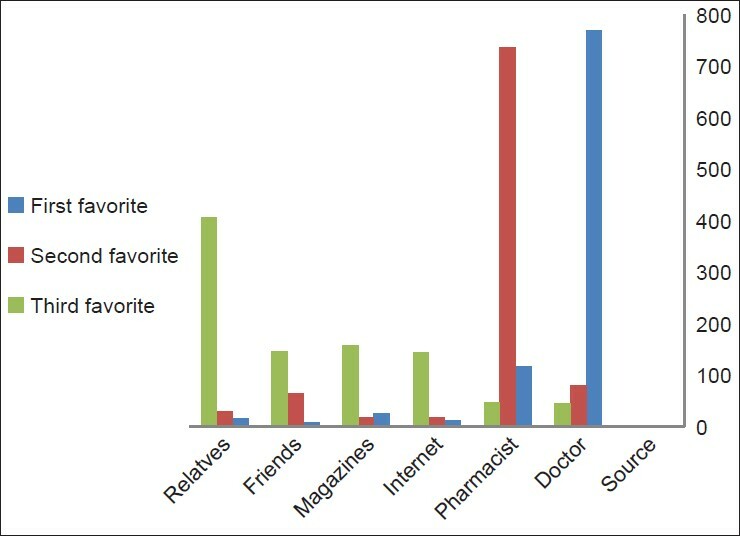 [Figure 2] illustrated the main sources from which parents retrieved health information. Doctors were the first favorite source for 769 (81.0%) of parents, while pharmacists were the second choice for 737 (77.7%) of them and relatives were the third favorite option for 407 (42.9%) of the parents. [Table 3] shows the reasons of parental self medication, the most common reasons were the expensive consultation fees and long waiting time in the clinics. Large portion of parents disagreed that healthcare workers' attitudes were bad, or that information relayed to them was insufficient. Another important finding was 488 (51.4%) of parents were convinced that they can diagnose their children's illnesses by the symptoms. The parental liberal self-medication practice in Sudan should be considered as alarming problem. Parents' knowledge on the diseases and treatments seems to be inadequate, and their self-medication practice was inappropriate. The most commonly used medicines were antibiotics and antipyretics, while the most frequently treated symptom was fever. The main reasons for parental self-medication were expensive consultation fees and long waiting time in clinics. Therefore it is necessary to expose Sudanese parents to a national program in rational use of medicines in children. The authors highly appreciated the hard work of data collection that was carried out by the undergraduate final students, batch number six, National Ribat University. 1. Lee D, Balasubramaniam K, Ali H. Drug utilization studies: Their transferability between industrialized and developing countries. WHO Reg Publ Eur Ser 1993;45:193-218. 2. Edwards DJ, Richman PB, Brandley K, Eskin B, Mandell M. Parental use and misuse of antibiotics: Are there differences in urban vs. suburban settings? Acad Emerg Med 2002;9:22-6. 3. Olayemi SO, Akinyede AA, Oreagba AI. Prescription pattern at primary health care centres in Lagos State. Niger Postgrad Med J 2006;13:220-4. 4. Fosarelli P, Wilson M, De Angelis C. Prescription medications in infancy and early childhood. Am J Dis Child 1987;141:772-5. 5. Eskerud JR, Laerum E, Fagerthun H, Lunde PK, Naess A. Fever in general practice I. Frequency and diagnoses. Fam Pract 1992;9:263-9. 6. Crocetti M, Moghbeli N, Serwint J. Fever phobia revisited: Have parental misconceptions about fever changed in 20 years? Pediatrics 2001;107:1241-6. 7. Maison P, Guillemot D, Vauzelle-Kervroedan F, Balkau B, Sermet C, Thibult N, et al. Trends in aspirin, paracetamol and non-steroidal anti-inflammatory drug use in children between 1981 and 1992 in France. Eur J Clin Pharmacol 1998;54:659-64. 8. Kai J. Parents and their child′s fever: Do as I say, not as I do? Fam Pract 1998;15:505-6. 9. Cantrill JA, Johannesson B, Nicolson M, Noyce PR. Management minor ailments in primary schoolchildren in rural and urban areas, Child Care Health Dev 1996;22:167-74. 10. Sudan demographics profile 2011. Available from: http://Indexmundi.com. [Last accessed on June 2011]. 11. Dawood OT, Ibrahim MIM, Palaian S. Parent′s knowledge and management of their children′s ailments in Malaysia. Pharm Pract 2010;8:96-102. 12. Oshikoya KA, Njokanma O F, Bello J A, et al. Family self-medication for children in an urban area of Nigeria. Paediatr Perinatal Drug Ther 2007;8:124-130. 13. Escourrou B, Bouville B, Bismuth M, Durrieu G, Oustric S. Self-medication in children by parents: A real risk? A cross-sectional descriptive study. Rev Prat 2010;60 Suppl 6:S27-34. 14. Bi P, Tong S, Parton KA. Family self-medication and antibiotics abuse for children and juveniles in a Chinese city. Soc Sci Med 2000;50:1445-50. 15. Awad A, Eltayeb I, Matowe L, Thalib L. Self-medication with Antibiotics and Antimalarials in the community of Khartoum State, Sudan. J Pharm Pharm Sci 2005;8:326-31. 16. Linder JA, Bates DW, Lee GM, Finkelstein JA. Antibiotic treatment of children with sore throat. JAMA 2005;294:2315-22. 17. Isturiz RE, Carbon C. Antibiotic use in developing countries. Infect Control Hosp Epidemiol 2000;21:394-7. 18. Chalker J. Improving antibiotic prescribing in Hai Phong Province, Vietnam: The "ant ibiot ic-dose" indicator, Bull World Health Organ 2001;79:313-20. 19. Pereira FS, Bucaretchi F, Stephan C, Cordeiro R. Self-medication in children and adolescents. J Pediatr (Rio J) 2007;83:453-8. 20. Balbuena FR, Aranda AB, Figueras A. Self-medication in older urban mexicans: An observational, descriptive, cross-sectional study. Drugs Aging 2009;26:51-60. 21. Tourinho FS, Bucaretchi F, Stephan C, Cordeiro R. Home medicine chests and their relationship with self-medication in children and adolescents. J Pediatr (Rio J) 2008;84:416-22.